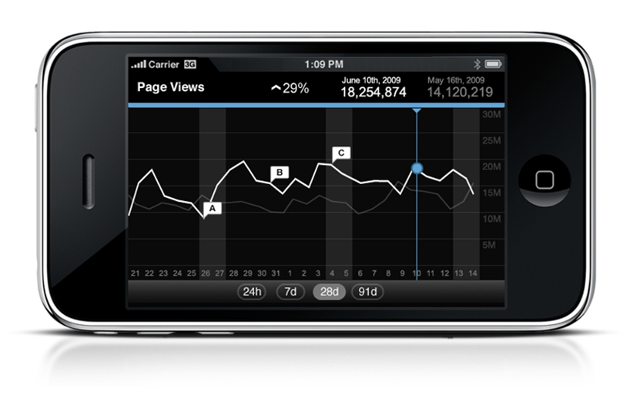 ExactTarget was the first ESP to create an iPhone app, way back in May of 2009. It is a free extension for any of ExactTarget’s customers, and allows Marketers mobile access to their account, giving them the power to pause or resume an email campaign in progress; view programmed sends in either a calender or list view; and access campaign dashboards. It requires iPHone OS 2.0 or later. At the time of this blogpost, only 54 people have rated this app in the AppStore but 19 have given it all five stars of the rating system; of the seven written user reviews, only one was critical. ExactTarget has about 8,000 customers of its full-fledged app; in the B2B world this is a healthy number, especially considering they have a pedigree list of global brands as these customers. So all in all, not having many downloads or reviews is not a bad thing, considering the small pool of users to begin with. Constant Contact, the popular ESP for small businesses, has come out with a free app that allows Marketers (and hypothetically salespeople) who subscribe to Constant Contact mobile contact management capabilities; they can remotely add new contacts to any existing account list. Additonally they can view, edit and search through contact lists, generate new contact lists, and create list segment based on a variety of categories. Updated in November of 2009, the current version requires iPhone OS 2.2.1 or later. In an interview last year by TMC with Len Bruskiewitz (@lbruskiewitz), Senior Director, Partner Programs, it was reported that there have been “thousands of downloads” of this app (and at the time of this blogpost, there have been 173 ratings and 23 user reviews in the AppStore. Since the app is free and use of it comes at no additional subscription cost, it is not hard to believe that there have been so many downloads. Omniture has had an iPhone app since late 2008 and is free to their subscribers. First released in spring of 2008 and currently compatible with iPhone OS 3.0, it allows access to your SiteCatalyst reports, bookmarks and dashboards. Of all the apps found for this blog, this surprised The Marketing Consigliere the most because (as of the date of this blog post) it had a decent amount of user ratings (230) but 109, or almost half of them, were only one star out of five. Of the written reviews, only a couple revealed operating glitches; the major complaint was that the app did not do enough for the user – that is, provided the raw data they wanted instead of basic dashboard graphs. Most likely this is due to the user being more of an IT or Web Analytics professional rather than a pure marketing person, hence a technical “power user” looking to so some great mental number crunching. Webtrends‘ app, updated this February, and requiring iPhone OS 3.1 or later, has a recent video that shows its basic functions. With only a handful of ratings and one review, mostly very positive, it was good to see an actual employee of the company demonstrate proper use of the app. Justin Kistner (@metafluence), the Senior Manager of Social Media Marketing at Webtrends, does a great, informal job of presenting the app. One feature he points out is the ability to email an analytics report to someone – In this case, the benefit of the feature is that a “busy busy” Marketing manager on the go can send the report to the “busy busy” executive who is too brick-headed to retrieve the report for him/herself. Kitara Media is a behavioral ad network that utilizes advanced targeting, and specific site reporting, enabling advertisers to identify and track a segmented audience. Via a global network of publishers, they can run ads with advanced demographic, behavioral, time-based and geo-based parameters. Kitara’s iPhone app allows website publishers a real-time window into all account activity: advertising revenue, performance and CPM information. It a can segment time periods to better understand traffic behavior to the sites in question. Last updated on the AppStore in July 2009, it has neither ratings nor reviews. While it operates out of the US Virgin Islands, it looks like use of this app is mainly found in a virtual ghost town. Cisco Mobile Supervisor, last updated in July 2009, is an add-on to the Cisco Supervisor Desktop on the iPhone. With this app, call center supervisors access real-time metrics via color-coded indicators of agent statistics and system metrics. Accordingly, supervisors can dynamically respond to changing situations from any location with network connectivity for their mobile device. Whether you want to see the oldest call in the queue or the status of a particular call center representative, this appears to be a great way to monitor a critical call center operation where minutes lost means money lost. With only 43 ratings, it would behoove you not just to look at it as a purely operational tool for call centers, but as a “canary in coal mine” for marketers should there be any anomalies the usual statistics generated from such an operation. The overall impression that The Marketing Consigliere gets from these iPhone apps is that in theory they are nifty, “shiny objects” but in reality they aren’t used that much, relative to the population of Marketers that use the full-fledged apps from desktops/laptops. These are the Marketing world’s equivalent of the pharmaceutical world’s “orphan drugs,’ where a cure for a problem exists and is made, but doesn’t necessarily make economic justification to the business. Do these iPhone apps, which extend the utility of their respective apps, really make a difference to the bottom line of a service provider? Are they used enough by marketers to really make a difference to them? Perhaps time will tell.